As long-time Fort Lauderdale DUI defense attorneys, we’ve encountered plenty of cases where defendants were arrested for drunk driving on America’s birthday (July 4th), around the holiday recognized for Jesus Christ’s birth (Dec. 25th) and of course the birth of each new year (Jan. 1st). Still, there is one holiday that sometimes gets overlooked as one accompanied by a seemingly higher risk of DUI arrest: Your own birthday. Recently, R&B singer Marcus Cooper, Florida native, member of the hip-hop group Pretty Ricky and reality show cast Love & Hip Hop: Miami, made headlines for a recent birthday DUI arrest in Miami Beach. Vibe Magazine reported a Miami Beach police officer clocked Cooper’s SUV speed at 100 mph in a 45 mph lane around 3:45 a.m. The officer alleged he witnessed the driver, later identified as Cooper, swerving and coming dangerously close to a collision with another vehicle. Interestingly despite this account, the officer officially cited the dark tint on the vehicle’s windows as the reasonable cause for initiating the traffic stop. The singer agreed to undergo a field sobriety test (which, side note, is not required by state law the way chemical alcohol and drug testing is under F.S. 316.1932, Florida’s implied consent statute). The officer reported the singer’s bloodshot eyes, slurred speech and comment that he’d been “partying for his birthday.” Defendant allegedly blew more than twice the legal adult driver alcohol limit of 0.08. The officer further alleged resistance and threats to phone a few famous friends. In an Instagram video (later deleted), Cooper lamented his 38th birthday was ruined and denied the charges, which in addition to DUI include resisting arrest without violence, reckless driving and driving with a suspended license. 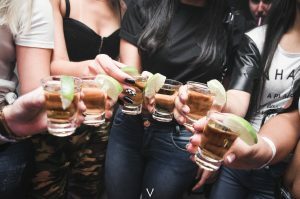 If the facts as alleged are true (and at this point, we must stress they are only allegations yet to be proven in a court of law), defendant’s confession of alcohol consumption – and the reason for it – may hurt his defense. And while he was required to submit to a breathalyzer test by state law (under penalty of an automatic one-year license suspension), it’s been the experience of our Fort Lauderdale DUI defense attorneys that field sobriety tests are often subjective and often do defendants few favors. But Cooper isn’t the only one whose birthday has gone sideways on the highways. U.S. Rep. Beto O’Rourke (D-TX) who recently lost a Senate election bid but gained favor as a possible 2020 presidential contender, wrote an opinion-editorial in The Houston Chronicle before the election, discussing a DUI arrest two decades earlier, on the day he turned 26. Although the incident wasn’t a secret, the details had reportedly been glossed over until he was under the glare of the national political spotlight. Reports are he was speeding on the Interstate near the Mexican border, hit a truck and spun into the middle lanes. A witness alleged O’Rourke tried to flee but ultimately stopped, registering a breath-alcohol level of 0.134 (at a time when the state legal limit was 0.10). It’s unlikely the incident played much of a role in the race outcome, but Fort Lauderdale DUI lawyers know a DUI on your birthday can have negative impacts that reverberate for months or years later – even if you aren’t or never go on to a high-profile career. At the start of the 2017-2018 school year, a school bus driver in Georgia was arrested for DUI after authorities said her vehicle had been weaving erratically with a busload of middle school students on board. The Atlanta Journal-Constitution reported the 49-year-old driver told the arresting officer she was “shocked” by chemical test results, which registered a 0.43 BAC. Normally, that would be under the legal limit, but commercial drivers are held to the more stringent standard of 0.04 BAC. She’d been out celebrating her birthday the night before with a few beers and a single shot of tequila, after which she slept, woke in the morning and felt fine, took a shower, ate breakfast and reported to work. During a field sobriety test, she told the officer she was too nervous and weak to stand on just one leg. There were also reportedly alcohol bottles in her purse (though it was unclear if they were open) and prescription pills, though she was not charged for having those unlawfully. In that instance, there may be several possible defenses an experienced criminal defense lawyer could explore. For instance, breathalyzer tests are known to have a margin of error, and it’s possible that hers could have been within that margin. It’s also possible plaintiff may well have been too nervous and weak to perform well on the field sobriety test, because as we mentioned earlier, the results can often be subjective. Bottom line: There is nothing legally wrong with celebrating your birthday by imbibing – even to a degree of excess if you choose (assuming you’re an adult over 21, aren’t under any court orders to refrain and aren’t responsible for the welfare of any minors at the time). The problem occurs on the drive home. If at all possible, arrange for a designated driver. Or call an Uber or Lyft. If are arrested for DUI on your birthday (or any other day of the year), make sure the Fort Lauderdale DUI defense lawyer you hire has extensive experience and a track record of success.